Gladys Berejiklian is travelling light. fixing Sydney's transport woes is going. So far the customers appear to be giving her the benefit of the doubt. But if she is feeling anxious she isn't showing it. end up being the only person who has a go at it. hand or a smile. Such is the political life. but she looks well and says she gets to the gym. bother asking about it!" I feel suitably chastened. But what does success mean? the time and never do anything. I won't do that." cautious; he won't get on with things. history as a do-nothing Premier. "Barry will be remembered very well,"
decisions that set the solid foundations for the future." "I'm only going to talk to Gladys." smile and I get the message. What about leading the party one day? concentrating on getting the best job done that I can." issue of gender in politics. applauded. So what did Gladys think? Really? I look at her but she is quite resolved. It seems hard to believe. I get a sense of how determined she can be. discrimination," she replies with a smile. you any privilege on the answer. capital coming from to fund any of them? government recommending the WestConnex roads project as its priority. rail, too. So where does that leave Gladys? that's what it has done. So how does she want to be remembered after the first term? it is available for most customers. and I gather has asked the same question. early when I did that. 1991 Joined the Liberal Party. 1996 Becomes only the third female president of the Young Liberals in NSW. 2005 Joins the opposition front bench. 2006 Becomes opposition spokeswoman for transport. boilermaker and nurse from Ryde. described Ms Berejiklian as the party's "peacemaker". state's best minister when it came to his old role. Transport Minister role despite her elevation. ($70 billion Australian Dollars) will be under her supervision. Berejiklian on it's Facebook page. Berejiklian used to be the Minister for Transport of New South Wales. She is the vice-chairwoman of the Liberal Party of New South Wales. 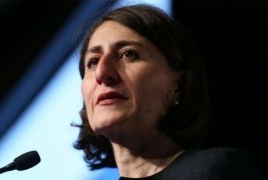 Treasurer of Australian New South Wales (NSW) state, Armenian Gladys Berejiklian, has decided to stand as candidate for the post of premier in the country’s largest state. Earlier, the previous Premier of NSW, Mike Baird, informed that he would resign starting from next week due to the health problems of his family members. In connection with this, the Armenian candidate wrote on her Facebook page that she was saddened by Baird’s decision. “I am deeply saddened that Mike Baird has announced his decision to retire from politics. Mike has been an inspiring leader and a man of enormous integrity who has left an outstanding and indelible mark on the state of NSW,” she noted. Treasurer Gladys Berejiklian has thrown her hat in the ring for the state's top job following NSW Premier Mike Baird's shock resignation. In a statement on Thursday afternoon, Ms Berejiklian said she was saddened by Mr Baird's decision to leave politics and that he was "inspiring leader" and a "man of enormous integrity". She also said Mr Baird was a friend and his leadership had made "NSW the economic and infrastructure powerhouse of the nation." "His compassion has also ensured a better quality of life for those most vulnerable," she said. "Today is Mike's day - but I would like to make it clear that I will be standing for the leadership." The current deputy leader was reportedly seen having coffee with Mr Baird just hours before he dramatically announced he was quitting politics via social media on Thursday morning. It's unclear if the treasurer will face any challengers, but it's believed Transport Minister Andrew Constance was sounding out support for a tilt. Another possible contender, Planning Minister Rob Stokes, is currently overseas. Ms Berejiklian would become NSW's second female premier if elected. The Labor Party's Kristina Keneally served in the top job from 2009 to 2011. Elected to Sydney's lower north shore seat of Willoughby in 2003, Ms Berejiklian is an experienced politician who has overseen massive surpluses and a strong budget performance as state treasurer. The former transport minister has remained largely scandal-free during her career, and it's likely her personal background as the daughter of working-class Armenian migrants who attended a public school would rate highly with voters. Mr Baird would not nominate a successor following his announcement on Thursday but said he would vote in the ballot. The state's Deputy Premier and Nationals leader John Barilaro said he believed Ms Berejiklian would make a fantastic premier. "I think the question will be, 'can the media pronounce Berejiklian - Barilaro government? '," he joked with reporters in Sydney. "But she is a fantastic leader and there are others in the Liberal Party that are touted that could be committed to leadership and I will committed to working with whoever the leader may be," he said. The New South Wales treasurer, Gladys Berejiklian, is all but certain to be the state’s next premier after her last likely rival for the job, Andrew Constance, declared he would not stand for the job. Constance released a statement on Friday, saying Berejiklian had his full support. “Gladys will make an excellent premier,” Constance said. “NSW should be glad to have her at the helm. Berejiklian confirmed she had spoken to Constance after Mike Baird’s surprise retirement announcement on Thursday but had declined to say whether he would stand in Monday’s spill. “I am not assuming anything ahead of Monday morning’s meeting and, in fact, if colleagues feel they want to put their hands up – no hard feelings, it’s a democracy,” she said. Analysis Baird's resignation: where does Magic Mike's early night leave New South Wales voters? Robert Stokes, believed to be Berejiklian’s most serious challenger, ruled himself out of the race on Friday morning. Stokes, a factional ally of Berejiklian and a close friend of Baird, was in London when the premier made his announcement. Earlier on Friday Berejiklian shrugged off an attack from the Sydney shock jock Alan Jones while confirming she would run for premier with the finance minister, Dominic Perrottet, as her deputy. The incoming premier will also need to deal with an added challenge thrown up by the Nationals on Friday, after the party’s leader, John Barilaro, vowed to stop controversial local government mergers in the bush, saying the Nationals would “no longer be taken for granted”. “The policy of local government amalgamations has impacted 20 councils, 12 of which are in regional NSW, causing uncertainty and anger, and others are locked in costly legal action – that all stops today,” Barilaro said. Jones launched a scathing attack on Berejiklian on Friday morning, saying she lacked the ability to be premier and was a bad choice. Jones, who called into 2GB radio while on holidays, said Berejiklian appeared to have been installed through factional manoeuvring and without proper process. He described her positioning as the next NSW premier as a “stitch-up”. Berejiklian was asked whether it would be difficult to govern without Jones’ support. “Look, I believe it’s hard for everybody putting up their hands for leadership in this state and nation, and it would be miraculous if everybody supported the same person. That is not what democracy is about,” she said. Berejiklian is in the centre of the NSW Liberal party, a faction that is closely linked with powerbroker Michael Photios. She said she had not spoken with Photios on Thursday, the day she announced her intention to stand. “The people who will decide who the next premier of New South Wales is are my parliamentary colleagues and I respect the process and I appreciate the public will have a say on who the next premier should be in two years’ time,” she said. Barilaro, the NSW national leader, on Friday pledged to end the merger of local councils in NSW’s regions, a policy that had been particularly damaging for the Baird government in rural seats. Barilaro pledged to make the issue his highest priority in the coming discussions, and said the Nationals would “not be taken for granted” in cabinet discussions. “There are no promises of portfolios – I made no deals when taking over as leader of the NSW Nationals and I won’t start now,” he said. “Everything is on the table – there are portfolios which I will be seeking as leader of the NSW Nationals and no doubt there are portfolios which the incoming Premier will be seeking. It is unclear what that would mean for councils that have already been merged, or for those which are still fighting the amalgamations in court. The opposition leader, Luke Foley, described Barilaro’s statement as a “search for relevance”. “Will he do the right thing and unwind the forced mergers that have already been implemented in regional NSW, will there be one policy for the regions, one policy for the suburbs of Sydney?” he said. “What about the central coast? What about the Hunter? What about the Newcastle/Port Stephens merger? What about the Wollongong/Shellharbour merger? Foley attacked Berejiklian for failing to answer questions about her vision for NSW during a press conference on Friday morning. Berejiklian was asked about her priorities for NSW, and what kind of permier she would be, but said she wanted to wait until after Monday’s spill before making such comments. She later said she was a hard worker, understood what it meant to face challenges and outlined the Baird government’s achievements. Gladys Berejiklian outlines her priorities and praises her Armenian migrant parents, saying she "will be governing for everyone", as she gives her first speech after being voted as the new leader in NSW. Gladys Berejiklian has outlined her priorities and praised her Armenian migrant parents, saying she "will be governing for everyone", during her first speech after being voted in as the new leader in New South Wales. The 46-year-old was sworn in as 45th Premier of NSW this afternoon after being elected unopposed as Liberal leader in an early morning partyroom meeting this morning, replacing Mike Baird. The meeting lasted 10 minutes and also saw Finance Minister Dominic Perrottet voted in as deputy party leader. In her first press conference as leader, Ms Berejiklian praised her parliamentary colleagues for putting their trust in her. "I thank them for determining, based on my performance, that I am best for the job and I am so excited that the party has come together united in support of my Premiership," she said. The Premier spoke movingly of her upbringing. "I haven't talked about this much previously but my father was a boilermaker, a welder, and one of the first jobs he did in Sydney was working on the Sydney Opera House, which is a great sense of pride for my family," she said. "My mum left school at 15 to support her family and became a nurse. "There wasn't a week that went by when my parents didn't remind us of how lucky we were to have the opportunities we have here in New South Wales." Ms Berejiklian said she would be governing "for everyone" in NSW. and building a strong economy, with an emphasis on more jobs. When a reporter asked whether she would be able to answer private questions, such as former prime minister Julia Gillard, about her single status, she laughed. "I have been in public life for a long time. I have been a senior minister for six years. I am ready for anything," Ms Berejiklian said. 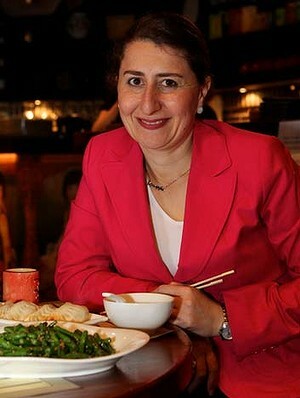 Ms Berejiklian has been the member for the Sydney north shore electorate of Willoughby since 2003. Mr Baird resigned as Premier on Thursday, citing the ongoing illnesses of close members of his family as the cause for his early exit from the leadership role. The Premier spoke about her upbringing on 2GB just after her successful partyroom meeting. "I want everyone in NSW to feel that they can do what I've done, that there's no challenge too big and that our state has those opportunities," she told the Sydney radio station. "I was actually born in Sydney but my parents were newly arrived immigrants, so we spoke Armenian at home, and when I started school I couldn't speak a word of English. "I remember my mother saying to me: 'Glad, even if you're not quite sure what the teacher's asking you, put your hand up and have a go'… I just remember that like nothing else and that's kind of kept me going for all my life." Vache Kahramanian from the Sydney-based Armenian National committee of Australia said it is a wonderful day for all the community. "Gladys Berejiklian, [who] is the daughter of migrants who came to Australia with limited English and survivors of the Armenian genocide, today has reached the highest office in our state of NSW and this is a monumental and proud achievement for our community and also a proud day for NSW as well." The state Liberal Party powerbrokers will be watching the first polls under the new leadership closely, with the party's popularity declining at the end of last year. Mr Baird suffered a record fall in satisfaction ratings as issues such as the failed greyhound ban and forced council amalgamations left the party's popularity reeling. The September Newspoll saw his net approval rating fall from 39 points in December 2015 to minus seven points, the biggest fall of any mainland state premier in the history of Newspoll. The Coalition's primary vote slumped six points to 42 per cent, while Labor's rose three points to 36 per cent. Despite Mr Baird's fall in popularity, he still led State Opposition Leader Luke Foley as preferred premier by a margin of 42 to 24 per cent. the premier-in-waiting is beholden to backroom players. "She is his prized jewel," one right-wing Liberal said. factions nearly tore the party apart. her back, given her own involvement as a factional player. long list of clients as part of his Capital Hill Advisory business. contracts to clients of Mr Photios' other business, Premier State. business -engaged only to help the firms draw up their tenders. pictured with another controversial lobbyist Joe Tannous. "quintessentially nice person" with "an iron will". "I heard she doesn't say much in cabinet," offers a-nother MP. "Pedantic. Perfectionist to the extreme," says another. Commonwealth Bank executive has always wanted the top job. prime minister as a Young Liberal. Lucy Turnbull, Mr Photios and MP John Sidoti. Christmas that she had turned them down this year. She is also close to Treasurer Scott Morrison. not having to take into consideration the needs of immediate family. "(Ms Berejiklian) can be married to the job," a supporter conceded. Australia at the end of the month. notion she had the inside running. Mr Baird said he would be "proud" to have Ms -Berejiklian as premier. attitude makes her perfect for the job," Mr Baird said. Berejiklian will rise to the challenge, her supporters say. eventually hit the lofty heights of NSW premier. family settled in North Ryde in 1973 when she was three. Her father Krikor and mother Arsha still live there. Primary School, but learnt quickly. Smalls Rd, began to take interest in wider issues. in 1985 when I was 15," she told NewsLocal in an earlier interview. activities, girl guides and, later, the Young Liberals. then the NSW branch's president. soon after he arrived in Australia. that from the beginning," he said. branch, which, he said, had been male-dominated. he decided to stand down. and in 2015 treasurer and industrial relations minister. Gladys Berejiklian, Prime Minister of New South Wells, Australia, is declared persona non grata in Azerbaijan. Aravot.am was informed from the list published on the website of Azerbaijan’s Ministry of foreign affairs. According to the list, Gladys Berejiklian “paid an illegal visit to” Nagorno Kharabakh in July 2013. At the moment, there are 324 citizens of different republics on that list. Among them are politicians, journalists, artists. The main reason to be declared as persona non grata is the visit to Nagorno Karabakh. Gladys Berejiklian’s grandparents were among those liberated when the Allies defeated the Ottoman forces in 1918, narrowly escaping the Armenian Genocide, writes historian Vicken Babkenian. "… it may be shown that [a] woman can take her place amongst the representatives of the people in the Parliament of the country and play her part in the political life of the nation." A portrait of Stanley hangs on the wall of the NSW Parliament House as a reminder of women’s success in politics since NSW legislation allowed them to stand for parliament in 1918. Fast forward almost a century to Monday 23 January 2017 and NSW has its first female premier from the conservative side of politics — Gladys Berejiklian. But there’s another link which binds these two women together that harks back to the time of the Great War. Gladys is the granddaughter of survivors of the Armenian Genocide, an event which shares the same timing and geographic setting of Australia’s Gallipoli experience. It’s a story historian ProfessorPeter Stanley and I tell for the first time in our book Armenia, Australia and the Great War. Just hours before the first Australians leapt out of their boats onto the beach that became Anzac Cove on 25 April 1915, the rulers of the Ottoman Empire embarked on a campaign to destroy the Empire’s native Christian Armenian population. Australian troops serving on Gallipoli and in the Middle East became witnesses. On Gallipoli and in Palestine, Armenians worked with the Australians as interpreters. Australian prisoners of the Turks saw Armenians being abused and deported; one recorded in his diary that 1.25 million people had died, a figure close to the accepted number. In Palestine, as the Light Horse advanced northwards towards the Turkish border, they came upon evidence of the atrocities, even rescuing Armenian refugees, survivors of massacre. In the remote reaches of northern Persia, Australians serving in "Dunsterforce" rescued thousands of Armenians. News of the genocide sparked a humanitarian relief movement in Australia in 1915, that culminated in the establishment of an Australian-run orphanage in Lebanon for about 1,700 Armenian orphans. Prime Minister Billy Hughes allowed free freight to the Middle East aboard the Commonwealth Line of Steamers for goods donated to the Armenian Relief Fund. Leading Australian feminists were at the forefront of this humanitarian relief effort, which included Millicent Preston Stanley. She had been "deeply concerned" about the tragic plight of the Armenian people and she advocated on their behalf. "Surely we will not be deaf to the cry of 120,000 [Armenian] orphans." As part of a large international humanitarian relief effort, Australians helped save the lives of tens of thousands of Armenian refugees across the Middle East, Europe and the Caucasus. Gladys Berejiklian’s grandparents were among those liberated when the Allies defeated the Ottoman forces in 1918. Their offspring were part of the wave of Armenian migrants who came to Australia in the 1960s when our nation’s White Australia Policy began to fade and our doors were opened to Armenian migrants. Their daughter, Gladys, born in Manly, has now taken the top job of the NSW State. Her success is a testament to the progress of Australian multiculturism and women’s equality that has helped provide the opportunity for Gladys to "play her part in the political life of the nation". Vicken Babkenian is the co-author with Professor Peter Stanley of Armenia, Australia and the Great War (NewSouth Publishing, 2016). Shortlisted for the 2016 Queensland Literary Awardfor History and the NIB Australian Military History Prize. Premier of Australia’s New South Wales (NSW) Gladys Berejiklian hopes to visit Armenia next year, she said in an interview with Armenian News-NEWS.am. Gladys Berejiklian, Armenian by origin, told about her visit to Armenia and Karabakh as well as her Armenian heritage. What is your main task as Prime Minister of New South Wales? New South Wales is home to 7.8 million people and is the largest of Australia’s six states. About a third of Australia’s population live in NSW. NSW has the largest, fastest-growing and most-diversified economy in Australia. It has an economy larger than Ireland, Norway and Israel. The role of the Premier is equivalent to that of a State Governor in the United States of America. The Premier is the leader of the Government, the most senior decision maker and most visible face of the State Government to the public. The Premier leads and coordinates the work of a Government Ministers across budgets, policy and new legislation. You visited Armenia and Nagorno-Karabakh together with the delegation of Australian politicians back in 2013. Could you please share you impressions of this visit? In July 2013, as part of a Parliamentary delegation of the NSW Parliamentary Friends of Armenia, I had the opportunity to visit Armenia in an official capacity. We visited Yerevan, Artsakh and other regions of Armenia. The trip embedded in both my colleagues and me, a deeper understanding of not only the Armenian way of life, but also the challenges and the significant strategic opportunities available to Armenia. You have constantly raised the Armenian community concerns in the parliament, including recognition of the Armenian Genocide and Karabakh issue. Do you think Australia can ever recognize the Armenian Genocide? As the granddaughter of survivors of the Armenian genocide, I am proud of my Armenian heritage and will continue to advocate for the recognition of the Armenian Genocide. This year marks the 20th anniversary of the unanimous recognition of the Armenian Genocide by the Parliament of New South Wales. We also have an Armenian Khachkar in our Parliamentary Garden to recognise the victims of the Armenian Genocide. I hope to visit Armenia next year as the Premier of NSW. 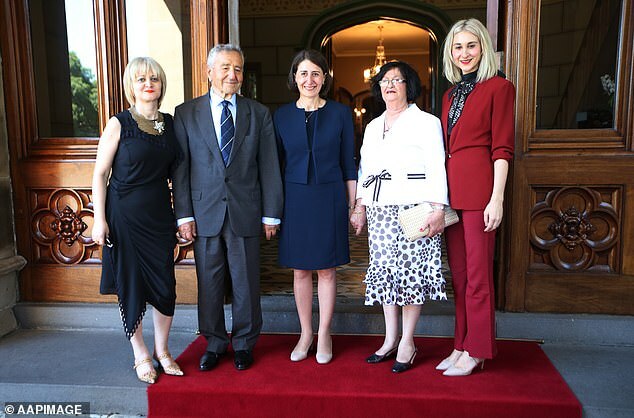 The Premier of Australia’s largest state of New South Wales, Gladys Berejiklian has been awarded the prestigious Mkhitar Gosh Medal by the President of Armenia, Serzh Sargsyan as part of Independence Day honourees announced on September 21. Berejiklian, the granddaughter of Armenian Genocide survivors, became the first Armenian-Australian Premier of a state in January 2017. She replaced retiring former Premier Mike Baird after having served as Treasurer of NSW under his leadership. The Armenian National Committee of Australia (ANC-AU) have congratulated Premier Berejiklian on receiving the Presidential honour from Armenia, which she will collect in person in due course. New South Wales Premier Gladys Berejiklian has opened up about the death of her long-lost twin sister and how it helped shape her strong work ethic. Speaking to The Australian, Ms Berejiklian, 58, recalled how she found out she had a twin when she overheard a family acquaintance mention it. She described how the family friend had visited their home one day and asked her mother Arsha 'where's the other one?' because she heard she was having twins. Despite the revelation, Ms Berejiklian said she didn't know for sure until she was about 12 or 13 years old, when she applied for a birth certificate to get a passport. Written on the birth certificate were the words 'elder of twin'. The premier said learning about the death of her twin gave her a greater appreciation for life and an obligatory sense to justify her existence by sacrificing. She said knowing she had a twin also gave her the inner drive to work hard and appreciate the understanding she didn't need to be happy all the time. Her mother, Arsha, told the publication she chose not to tell Gladys she had a stillborn twin because she didn't want to upset her. She said she had often wondered whether the twin would have been like Gladys, but added just thinking about her death made her sad. The premier's sister, Mary, also told the publication her sister has often spoke about how she felt as though someone was shadowing her. Ms Berejiklian said her 'deep gratefulness' for life also stems from being born in Australia as a result of the choices and sacrifices her parents made. 'My parents are both really smart people, neither of them got a chance to finish high school. Life is precious. My motto's always been: 'Try to make a difference',' she said.